There are many materials for internal furnish of walls, for every taste. Them Wallpaper, panels of different materials, upholster leather, cloth, coat decorative plaster. Each of these finishes has advantages and disadvantages. Are no exception, and plastic panels. Someone willing to use them to finish someone doesn't want to hear about it. What are the pros and cons of plastic wall panels? Advantages of this type of wall covering many. First of all, plastic panels are moisture resistant, so they can be washed, and use in areas with high humid climate, for example, in the Primorsky Krai. Due to the fact that their surface is almost perfectly smooth, there are no cracks and pores, which are the perfect "shelter" for mold, fungi, bacteria. Panels made of polyvinyl chloride (PVC), very durable. With careful handling these panels will last for many years without losing its presentation, that is, not deformed and not vizueta. However, from the point of view of environmentalists, this durability is a very serious drawback, but for the consumer it is certainly a plus. They do not warp, not crack, not susceptible to rotting and other negative factors. In addition, PVC panels are not afraid of sudden changes in temperature and humidity, which is important in our climate. And the installation of wall coverings is simple, requires lot of time and effort. To sheathe the walls with plastic panels will easily be able to practically anyone with experience with the tools. It is possible to save a significant amount in the remuneration of specialists of this profile. However, if you live in an area where the humidity is quite high, before sheathing the walls, treat them antifungal. Sheathing PVC panels can not only the walls but also the ceiling, resulting in it will be beautiful, smooth and not in need of repair. It is also important that the covering of walls and ceiling with plastic panels leads to the formation of large quantities of debris, as when using many other types of materials. Finally, PVC panels are inexpensive, due to the low cost of raw materials and ease of production, and thus have exclusive variety of colours and patterns. For a reasonable price, affordable to almost every customer, you can pick up those panels that are best suited to the tastes and wishes of the customer, as well as most furnishings and other items of home interior, for example, you can find panels blue, Golden color. The fears of some people that PVC panels emit no harmful substances, as a rule, unfounded. The fact that this type of plating is widely used not only in administrative and public buildings, but educational institutions and even healthcare institutions, very eloquent. Important – try to buy a plastic plate manufactured reliable, proven company. This will guarantee that this finishing material is made of high quality raw materials, under strict observance of technological regulations and meets all health and safety standards. What are the disadvantages of plastic wall panels? A lot of them too. First, while the polyvinyl chloride is practically safe in case of fire, it emits toxic gaseous substances that can easily be poisoned. Secondly, wall plastic panels are quite fragile and by accidental impact, even slight, on the surface is formed a dent or even a hole. Thirdly, with all the variety of colors and patterns wall plastic panels give the room too formal. Of course, tastes differ, but the majority of people hardly will want to have their houses looked like, for example, as a service office. Thus, before sheathing the walls of their homes with plastic panels, you need to consider every angle and to consider both the pros and cons of this type of finish. 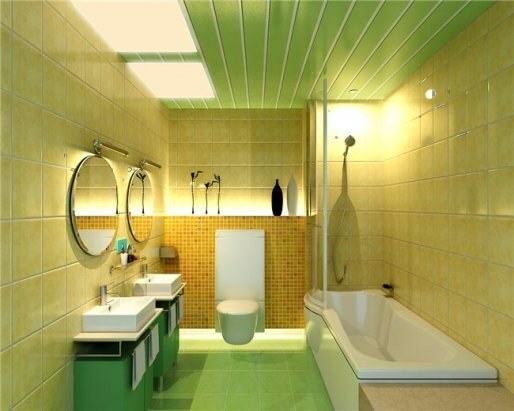 Plastic panels is one of the best options for covering bathroom walls. First of all, thanks to resistance to moisture and lack of conditions for development of mold, fungi. Such panels can be quickly and easily sheathed bathroom, it does not require preliminary alignment of the walls, removal of old paint, etc. it is only Necessary to attach to the walls of the wooden support rails, which are subsequently glued plastic panels. When marking panels prior to installation do not use sharp objects, as traces of them erased. Best put the label soft pencils or markers. For panels in bathrooms is very easy to care for. We only need to gently wipe them with a damp cloth, and they will take the original form. Finally, due to the low cost of PVC panels, finishing of the walls of the bathroom plastic will cost much less than finishing tiles. In the sale you can find a wide range of wall panels for bathroom, the picture is very similar to the tile.